Aging Canines: The 7 Year Twitch | All Around Dogs Aging Canines: The 7 Year Twitch | Thoughts on training and life with dogs. The presumed life expectancy for a Boxer is either 8-10 or 10-12 years, depending on which website you visit. Its been my observation that 10-12 has the best chance to be true if you own a well-bred Boxer and have good luck. 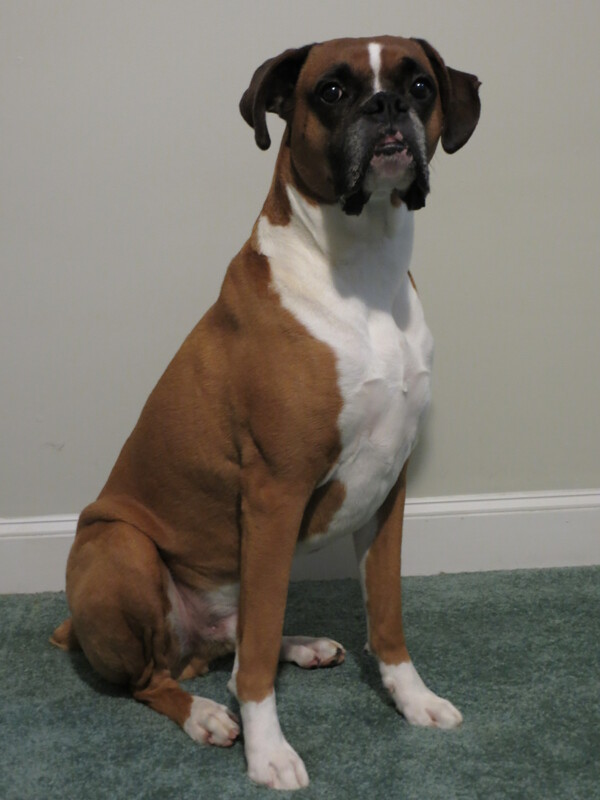 Poorly-bred Boxers seem to fall into the 8-10 range, with some long-lived exceptions. 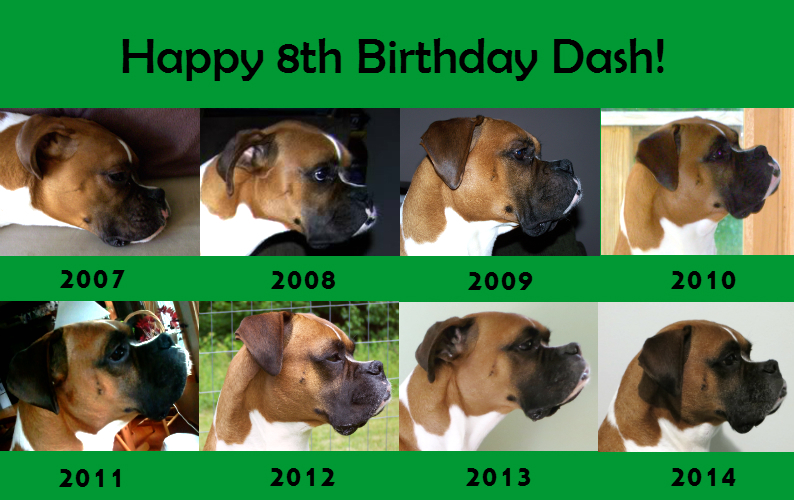 My first two Boxers, Xena and Dash, were/are both poorly bred and our luck was/is not great. So reaching the 7 year milestone has, thus far, marked a significant change for me. I morph from mostly sane and reasonably concerned dog owner to slightly paranoid and overly worried dog nut, and the number of vet visits see an uptick. I let too much of my last two years with Xena be dictated by my fear of her impending death. I brought her to the vet numerous times, convinced she had cancer or DM (degenerative myelopathy) or some other scary unknown problem. I’d finally stopped panicking at every little thing when she died from hemangiosarcoma. I had become so used to overreacting that the dire nature of her distress that day didn’t sink in right away. It felt like a collage-worthy occasion. And here is where I hope my lesson with Xena comes into play. I haven’t gotten the test. Part of me is tempted because his information could contribute to research on the disease. But I also need to keep my worry in check and a positive result might be too much for me. For the most part, I am paying attention to his weight and movement and we are trying to get him more exercise (especially after such a long winter). We’re working on his behavior modification program as a way of decreasing his stress levels, which is good for both his body and mind. He hasn’t been back to the vet since his X-rays and I’ve actually put off going in for his yearly wellness check. It is scheduled for today, and I’ll admit that I mentioned a couple of “off” behaviors I wanted to talk about in addition to getting his regular thyroid and SNAP tests. I know that I need to focus on supporting his health, rather than worrying about it. I want to leave space to soak in the wonderful time we do have together, however long that might be. It is not easy, but I am trying. Dash is just worried that I’ll use the flash when I take his picture. When age creeps up on a pet, the day you realize, you get that awful sinking feeling in your stomach don’t you. Like suddenly noticing they’ve gotten alot more grey, or a tad more sleepy. They’re so special aren’t they. It is hard. Although I was surprised when I put his timeline photo together that you could barely see his gray. Funny how gray works, in both dogs and humans – some get it early and lots of it, others just get a wee bit of frosting. Always! And his vet visit went well, so if his bloodwork comes back clean, my “twitch” should go away from a while! I also have a dog named Dash. He is a 3 year old Whippet. I had a Saluki who lived to be 15. He had a heart murmur. It just got to the point that he couldn’t support his own weight. Just like tht. he had become somewhat incontinent and confused, too, but not being able to walk was the deciding issue for me. But it wasn’t his heart. So…you just never know, I groomed (shaved—don’t get me started…) a 12 year old golden Retriever today. at least 30 lb. over weight. He has just been to the vet, and he didn’t say how top reduce his caloric intake (I suggested sodiun free canned green beans). This dog is definitely living on borrowed time. My first dogwalking charge was a Whippet mix. Sweet and quiet, loved to run. And I know what you mean about the fat dog. Especially Goldens and Labs. I saw a Golden that looked about 40# overweight and the owner said it was all his fluffy fur… umm, no, I cannot feel any ribs. At all. I knew one that lived until 15, I don’t understand how he made it, especially since chronically long toenails had hobbled him.